This year has been a good one for me and my blog. I've gained a few more followers than I thought I would this year, met a load of amazing Herts/Beds bloggers, been invited to so many events (that I couldn't attend due to late notice and work hours - boo! ), and I think it's safe to say I think I blog better these days too. I've really enjoyed it more than I have done before this year, and I'm happy to say, you girls have really been a part of that. I'm no big time blogger, I'm not super-popular and I'm still just a girl sharing her views on make-up and beauty products, her style and fashion choices, and sharing bits of love and life with you, but I really feel happy with where me and my blog are. Just as a thank you, to show you girls how much I appreciate you following, reading and commenting on my blog, I want to do a little beauty giveaway. It's not a big thing, again just a little thank you, since now there are about 600 collectively from GFC and BlogLovin' and it's also just a little fun too! 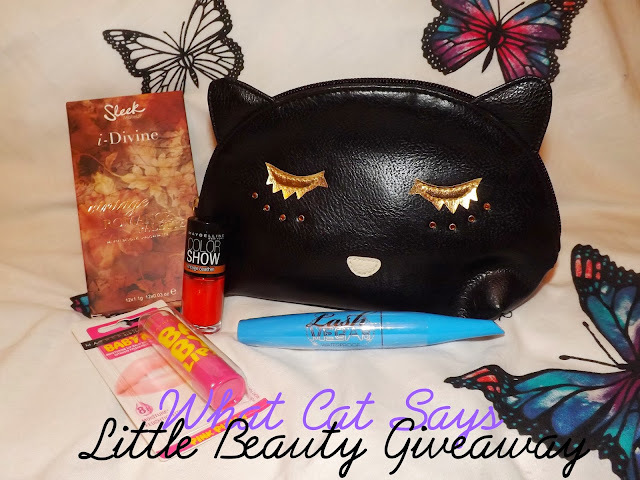 A Cat Make Up Case, Maybelline Babylips in Pink Punch, Maybelline Color Show Vintage Leather in Red Grained, Barry M Lash Vegas in Black Waterproof and Sleek Make-Up i-Divine Vintage Romance Palette. Just a few simple rules.... 1. The giveaway will run for 3 weeks, as 3 is my favourite number. And I also don't want it to run too close into Christmas and get lost with Santa's presents! 2. It will be international too, so anyone can enter! 3. The winner will be picked via Rafflecopter and given 48 hours to reply. Failing to do so, I will pick another winner via Rafflecopter. 4. I am open to all entries from compers and bloggers (as I am an amateur comper myself), but I won't be taking entries from people who make accounts solely for giveaways. Just because I don't think it's very fair. I will also be checking every entry to verify they are all real to make this fair for everyone. I'd love to win the Sleek eyeshadow palette! I'd love the cat palette, the makeup bag or the mascara! I'm asking for a good camera this year so that I can do loads more outfit posts! I love the make up bag!!! I I would like to win the Sleek Palette! I'd love to win because I'm not expecting much for Christmas this year and it'd be a lovely treat to win this! On my Christmas present this year is some yummy Hotel Chocolate goodies to over-indulge in! love the makeup bag.. i wanna win because i have never tried any of these products! Please leave a link to your google plus profile, i can't find it anywhere. i want new shoes but i love trying new makeup thats why i want to win! I'd love to win the palette, so nice and I've been looking for the vintage romance one.